Amanda Sevall Designs: First things first... Must. Have. Hot. Water. Look at those Costco stashes! Wouldn't be complete without Brian's ketchup!! :) And in the background? Construction of the hardwood floors in process. It was sad to lose the laundry room portion of the floor to water damage. Brian worked fast to pull out the floor in the laundry room and the damaged part of the adjoining hallway. Now it looks like this. There is still more linoleum to rip out in the laundry room, but it is going to wait until we are ready to replace the floor. Last weekend, Brian worked hard to reinsulate the garage side of the wall, put in a new platform, new drain pan (no future water damage we hope!) and a new water heater. Thanks to some help from our neighbor Felipe to lift the new one into place. Tankless = ENDLESS hot water. Tank + recirculating pump = INSTANT hot water. You just need to choose which way you want to go. Brian wanted instant. I preferred the tankless due to the energy efficiency. What can I say, I'm sorta turning into a tree hugger. Not an extreme one, but if we can go green in anyway, I'm game. Other issue? I learned quickly about BTU's per hour. Our current used 31,000. The tankless? 135,000. Or something like that. Bottom line is the demand when the tankless is operating for gas is so high that you actually would need to increase the gas line size coming into your house. Which requires a professional plumber and more time. Ultimately, we passed on the tankless for the tank + recirculating pump in the interest of instant hot water for Brian. He didn't want to wait for hot water to reach the faucet. Even if it was only a 30 second wait... I deferred on this one for the inconvenience that would have been having to install the tankless for a professional. It would have meant more time with no hot water. And a little bit more money. I did, however, convince Brian to get the energy star rated gas tank. A little higher BTU than the similar non-energy star version and about $100 more, but more efficient and environmentally friendly. All told, Brian only encountered three problems. First was difficulty manuevering the new tank into the enclosure -- the pipes were too low & had to be replaced. Second was getting it to fit into the enclosure -- the existing gas valve stuck out too far hitting the tank and needed to be replaced. The second was the more annoying because it caused another trip to Home Depot (which was closed at time of discovery) and thus another day without hot water. The third was most annoying because it caused another day of delay for another trip to Home Depot -- the water pipes going into/out of the tank were the wrong size. But now the new tank is in and working perfectly. Some sort of pipe issue for Brian to solve, but we have hot water, so I'm good. :) Onto clean up, drywall replacement, painting, tile, hallway floor replacement and new washer/dryer.... it's going to be a long process! 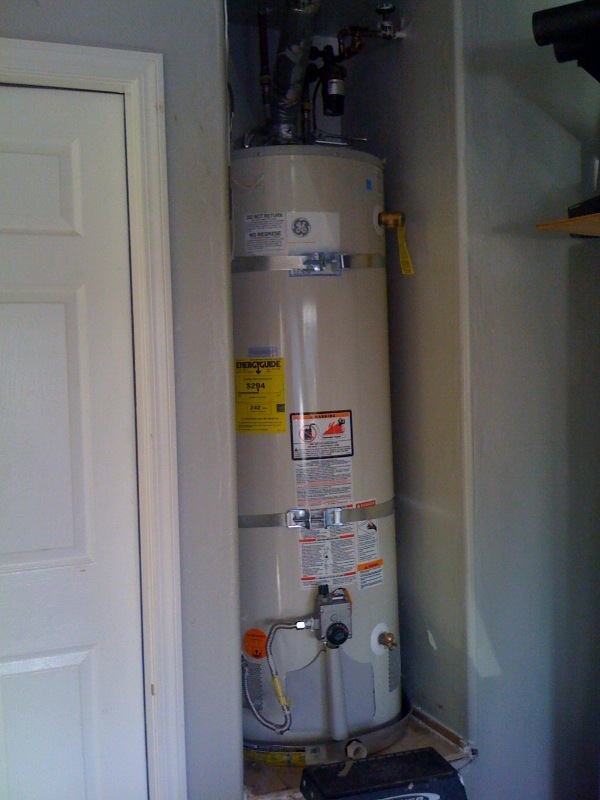 So have you ever had to replace a water heater? Did you go with the new tankless water heaters? Oh my goodness girlie! What a mess! I'm sorry you've had to deal with no hot water and all of the problems of getting it fixed. I hope that it won't be long until everything is fixed again!!! Yes, Hot water is a must. What an important upgrade!!! Wow- what a pain in the neck this all is. Expensive and so time-consuming! I hope everything is back to normal pronto. Sounds like you made the best decision for you. We didn't go with the tankless, but now I can't remember why. I was thinking it was mainly cost, but maybe it was the gas issue.